This MK System is designed for precision cleaning of a family of heat exchangers with tenacious carbon deposits. 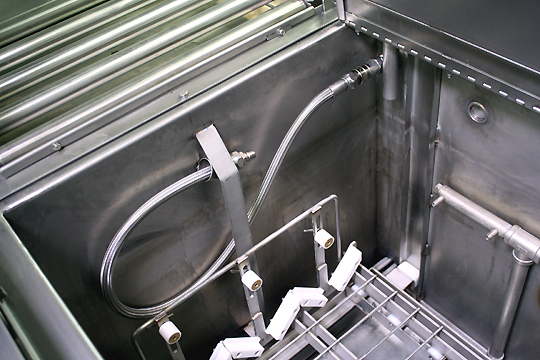 The carbon is imbedded within a mass of fine tubes requiring a combination of ultrasonic cleaning (to loosen the contaminants) and turbo/agitation/flushing/backflushing to fully remove the residuals from within the assemblies. A variety of sizes and configurations are accommodated using a special work carrier. The nature of the carbon required an alternative solvent (with high flash point) for washing process a secondary solvent for rinsing. The process incorporates an automatic flushing and backflushing system designed to remove loosened soils from deep within the heat exchangers. This is done automatically during the process sequence. The process sequence starts with powerful ultrasonics to both clean the exterior and interior of the heat exchanger. Then loosened soil is automatically and repeatedly flushed and backflushed for a timed cycle. The overall process is then repeated using rollovers (see below). A high volume all stainless steel vertical immersion pump is used with a large stainless steel filter canister. To handle residual heat build-up from turbulation and/or ultrasonics an auxiliary cooling system (either connected to a chiller or cold water source) is included. 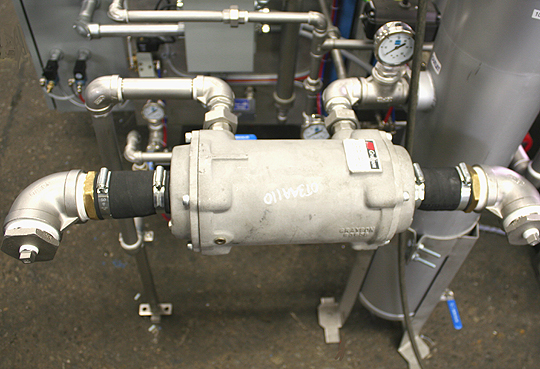 A compact heat exchanger is used for this application and is placed in line with the filtration unit. It automatically controls any excess heat build up in the solvent if encountered during the process. 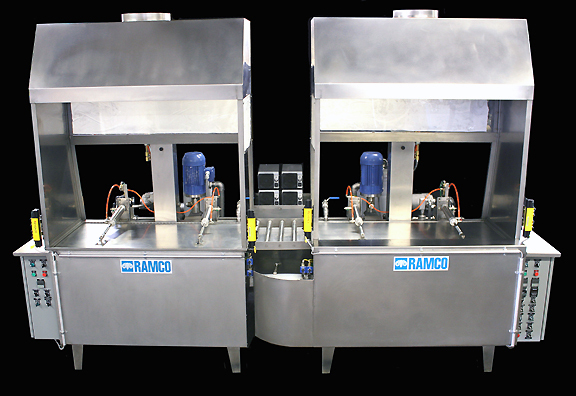 Other features include dual pneumatic power covers with light curtain safety interface, digital indicating temperature controllers, digital sequenced cycle timers, platform roller conveyors for easy transfer, both overhead and lip ventilation and a custom work carrier (see below). The system is CE certified.